The F3 Treadmill is the first of its kind— a foldable treadmill that doesn't sacrifice quality. It's loaded with everything that has made Life Fitness treadmills the top choice among discerning exercisers around the world. And the highest-quality components ensure years of rugged use. The F3 is so sturdy and sleek, you'll be amazed that it actually folds. Pair it with the Basic Workouts Console for an extremely easy-to-use interface with the essential workout programs you'll need to maintain an effective fitness regimen. *Note: Most of the sites, stores or shopping portals listed above sell Cardio Fitness F3 Basic Console Treadmill with discounts and other exciting offers. There is a possibility that the some of above websites are not selling Cardio Fitness F3 Basic Console Treadmill now. Toughtrain.com is not liable for such cases or instances. 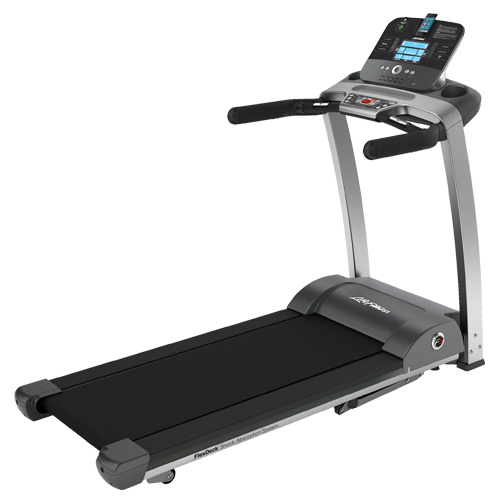 Also we do not recommend any seller for Cardio Fitness F3 Basic Console Treadmill and a buyer should buy from where he/she gets best deal with quality of products, service and on time delivery (shipment).